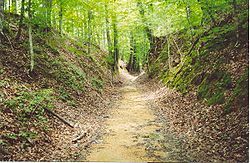 The Natchez Trace, also known as the "Old Natchez Trace", is a historic forest trail within the United States which extends roughly 440 miles (710 km) from Nashville, Tennessee, to Natchez, Mississippi, linking the Cumberland, Tennessee, and Mississippi rivers. The trail was created and used by Native Americans for centuries, and was later used by early European and American explorers, traders, and emigrants in the late 18th and early 19th centuries. European Americans founded inns, also known as "stands", along the Trace to serve food and lodging to travelers. As travel shifted to steamboats on the Mississippi and other rivers, most of these stands closed. Today, the path is commemorated by the 444-mile (715 km) Natchez Trace Parkway and Bridge, which follow the approximate path of the Trace, as well as the related Natchez Trace Trail. Parts of the original trail are still accessible, and some segments are listed on the National Register of Historic Places. Largely following a geologic ridge line, prehistoric animals followed the dry ground of the Trace to distant grazing lands, the salt licks of today's Middle Tennessee, and to the Mississippi River. Native Americans used many early footpaths created by the foraging of bison, deer, and other large game that could break paths through the dense undergrowth. In the case of the Trace, bison traveled north to find salt licks in the Nashville area. After Native Americans began to settle the land, they blazed the trail and improved it further, until it became a relatively well-established path. Numerous prehistoric indigenous settlements in Mississippi were established along the Natchez Trace. Among them were the 2,000-year-old Pharr Mounds of the Middle Woodland period, located near present-day Tupelo, Mississippi. The first recorded European explorer to travel the Trace in its entirety was an unnamed Frenchman in 1742, who wrote of the trail and its "miserable conditions". Early European explorers depended on the assistance of Native American guides to go through this territory — specifically, the Choctaw and Chickasaw who occupied the region. These tribes and earlier prehistoric peoples, collectively known as the Mississippian culture, had long used the Trace for trade. Even before the 1803 Louisiana Purchase, President Thomas Jefferson wanted to connect the distant Mississippi frontier to other settled areas of the United States. To foster communication with what was then called the Southwest, he directed construction of a postal road to be built between Daniel Boone's Wilderness Road (the southern branch of the road ended at Nashville) and the Mississippi River. The U.S. signed treaties with the Chickasaw and Choctaw tribes to maintain peace, as European Americans entered the area in greater numbers. In 1801 the United States Army began trail blazing along the Trace, performing major work to prepare it as a thoroughfare. The work was first done by soldiers reassigned from Tennessee and later by civilian contractors. To emphasize American sovereignty in the area, Jefferson called it the "Columbian Highway." The people who used it, however, dubbed the road as "The Devil's Backbone" due to its remoteness, rough conditions, and the frequently encountered highwaymen found along the new road. By 1809, the trail was fully navigable by wagon, with the northward journey taking two to three weeks. Critical to the success of the Trace as a trade route was the development of inns and trading posts, referred to at the time as "stands." Many early United States settlements in Tennessee and Mississippi along the Natchez Trace. Some of the most prominent were Washington, Mississippi (the old capital of Mississippi); "Old" Greenville, Mississippi (where Andrew Jackson conducted domestic slave trade); and Port Gibson, Mississippi. The Natchez Trace was used during the War of 1812 and the ensuing Creek War, as soldiers under Major General Andrew Jackson's command traveled southward to subdue the Red Sticks and to defend the country against invasion by the British. By 1817, the continued development of Memphis (with its access to the Mississippi River), and Jackson's Military Road (heading south from Nashville) formed more direct and faster routes to New Orleans. Trade shifted to either these routes along the east or west of the area, away from the Trace. As author William C. Davis wrote in his book A Way Through the Wilderness (1995), the Trace was "a victim of its own success" by encouraging development in the frontier area. With the rise of steamboat culture on the Mississippi River after invention of the steam engine, the Trace lost its importance as a national road, as goods could be moved more quickly, more cheaply, and in greater quantity on the river. Before the invention of steam power, the Mississippi River's south-flowing current was so strong that northbound return journeys generally had to be made over land. Although many authors have written that the Trace disappeared back into the woods, much of it continued to be used by people living in its vicinity. With large sections of the Trace in Tennessee converted to county roads for operation, sections of it continue to be used today. Though the Natchez Trace was used as a major United States route only for a brief span, it served an essential function for years. The Trace was the only reliable land link between the eastern states and the trading ports of Mississippi and Louisiana. All sorts of people traveled down the Trace: itinerant preachers, highwaymen, traders, and peddlers among them. As part of the "Great Awakening" movement that swept the country in the late 18th and early 19th centuries, the "spiritual development" along the Trace started from the Natchez end and moved northward. Several Methodist preachers began working a circuit along the Trace as early as 1800. By 1812 they claimed a membership of 1,067 Caucasians and 267 African Americans. The Methodists were soon joined in Natchez by other Protestant denominations, including Baptist missionaries and Presbyterians. The latter accompanied the migration of Scots-Irish and Scots into the frontier areas. Presbyterians and their frontier offshoot, the Cumberland Presbyterians, were the most active of the three denominations in this country area. They claimed converts among Native Americans. The Presbyterians started working from the south; the Cumberland Presbyterians worked from the north, as they had migrated into Tennessee from Kentucky. As with much of the unsettled frontier, banditry regularly occurred along the Trace. Much of it centered around the river landing Natchez Under-The-Hill, as compared with the rest of the town atop the river bluff. Under-the-Hill, where barges and keelboats put in with goods from northern ports, was a hotbed of gamblers, prostitutes, and drunken crew from the boats. Many of the rowdies, referred to as "Kaintucks," were rough Kentucky frontiersmen who operated flatboats down the river. They delivered goods to Natchez in exchange for cash, and then sought gambling contests in Natchez Under-the-Hill. They walked or rode horseback the 450 miles back up the Trace to Nashville. In 1810 an estimated 10,000 "Kaintucks" used the Trace annually to return to the north for the start of another river journey. Meriwether Lewis, of the Lewis and Clark Expedition fame, died while traveling on the Trace. Then serving as appointed governor of the Louisiana Territory, he was on his way to Washington, D.C., from his base in St. Louis, Missouri. Lewis stopped at Grinder's Stand (near current-day Hohenwald, Tennessee), for overnight shelter in October 1809. He was distraught over many issues, possibly affected by his use of opium. He was believed by many to have committed suicide there with a gun. Some uncertainty persists as to whether it was suicide. His mother believed he had been murdered, and rumors circulated about possible killers. Thomas Jefferson and Lewis's former partner, William Clark, accepted the report of suicide. Lewis was buried near the inn along the Trace. In 1858, a Tennessee state commission erected a monument at the site. On the bicentennial of Lewis' death (2009), the first national public memorial service honoring his life was held; it was also the last event of the Lewis and Clark Expedition Bicentennial. A bronze bust has been installed at his grave site. ^ a b c d e f g h i Devoss, David (May 2008). "End of the Road". Smithsonian Magazine. 39 (2): 72. Retrieved August 5, 2008. ^ Cotterill, R. S. (April 1921). "The Natchez Trace". Tennessee Historical Magazine. 7 (1): 29–35. Crutchfield, James A. (1985). The Natchez Trace: A Pictorial History. Nashville, Tennessee: Rutledge Hill Press. ISBN 0-934395-03-9. Davis, William C. (1995). A Way Through the Wilderness: The Natchez Trace and the Civilization of the Southern Frontier. New York: HarperCollins Publishers. ISBN 0-06-016921-4. .
Wikimedia Commons has media related to Natchez Trace.